We had breakfast at our hotel, and then headed back to the field to finish work on our Russbils. First we were filmed getting out of our tents fully dressed and ready to go, as if we had slept there the night before – another fun look into the “reality” of reality TV. 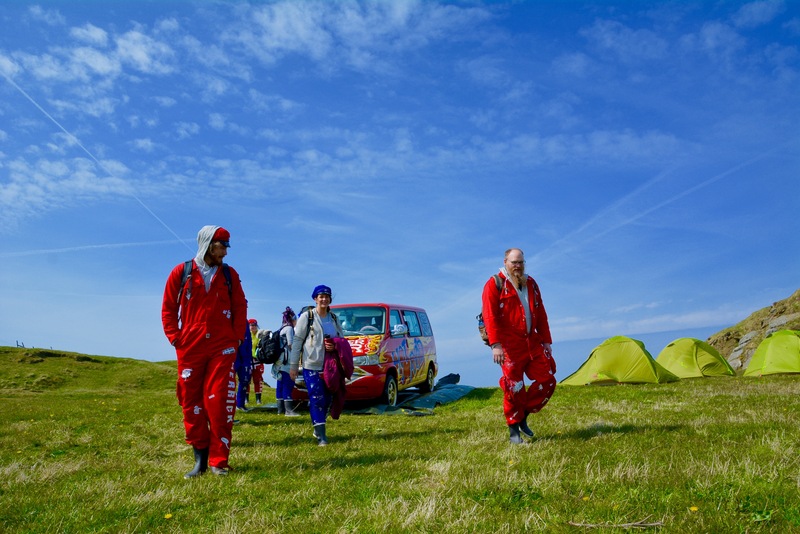 Luckily, we had more than the hour they had mentioned last night to finish our vans – it was actually closer to 2.5 hours, which our team really needed. With that said, the red team’s van looked INCREDIBLE. They had lips on the front, a crazy amount of detail on the paint job, and an interactive kissing side panel (lips came together and kissed when the sliding door opened and closed.) None of us on the blue team were feeling at all confident as we returned to our Taylor Swift HJ car. With that said, I got to work on stencil hearts, Thomas added detail to the illustration, Kelsey finished the inside lyrics and interior decoration, Joni made snowflakes for the inside, Richard finished awesome ski poles and secured them to the front grill of the van and helped me tape lights inside the van, and Lauren finished the inside seats. 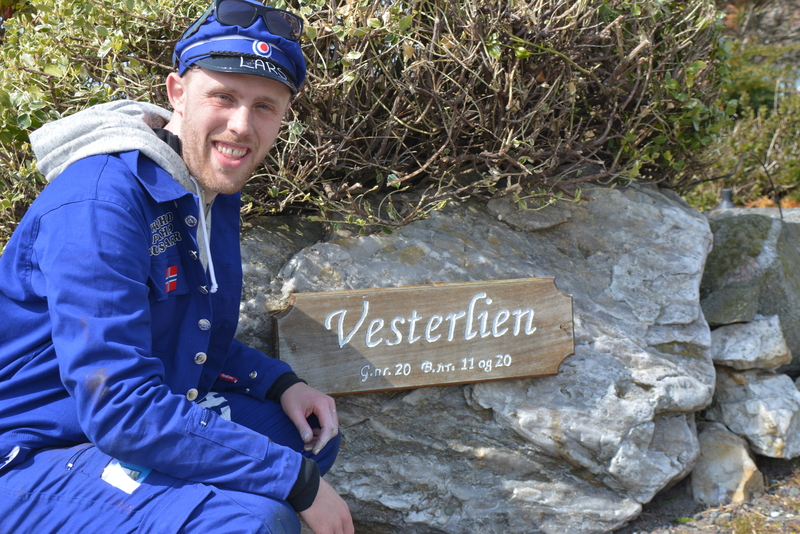 We had lunch at lunch at “Vesterlien Farm”… no relation to my Vestre Lia/Lien Farm in Tvedestrand, but still pretty neat! As a group we all went to a local gas station and were filmed driving our cars around town. We had fun rocking out to Taylor Swift, literally rocking our car back and forth. At this point we had nothing to lose, but honestly we were all a bit resigned to defeat. They had Jeff (pro designed) and Heidi (pro painter/artist) who had created one of the most beautiful pieces of car art I’ve ever seen… and we used stencils. Red team with the incredibly creative russbil! Shout out to Kelsey for killer the T-Shaft logo! Back seat of the Stavanger Banger shag wagon. Literally one of the most impressive pieces of art I’ve ever seen. Group shot with our vans! After a bit of a wait, we were told to drive our Russebils to a dock a few blocks away. When we arrived there were 60-70 Russ with a huge bus and ~5 other Russ vans waiting for us. We filmed our arrival a number of times, and then were immediately ushered behind the huge Russ bus while they filmed our cars close up, and let the kids vote on their favorite. At the big reveal (which Fridtjof stretches out forever) it’s announced that the difference was a single vote! We somehow have a shot!? I figured red would win by a landslide. Finally Fridtjof announces the winning team is… BLUE! … WTF?! That can’t be right! I’m floored… my jaw is still on the floor as I write this. Red’s was clearly cooler looking, but we went a TOTAL different route and competed on theme. In talking with the Russ after the fact, they liked the cohesion of the Peter Northug and Taylor Swift theme. They liked the interior quotes, lights, pom poms, seats, poles… but still, WTF? A HJ joke just won us another week in paradise?! It doesn’t seem real at all. It was particularly tough on Kate and Heidi… and I felt bad that they had to be interviewed right after the decision was announced. Drinking a beer with no hands (something I tried prepping for back at home, but failed at miserably on camera). A funny behind the scenes tidbit – we weren’t allowed to show the beer labels on camera, and we later learned that it was all non-alcoholic beer. We than all made our way back to the main Thadland themed Russbus to party with all the Russ who had voted on our vans. It was a great time with the graduating seniors, and a taste of what it would really be like, but regardless of what the final TV product will look like, it was all very staged for the cameras. The red team had to leave to go study for their upcoming classroom challenge, while we go to stay out and “party all night” with the Russers. All night meant 20 minutes of filming inside the bus, but then we had to leave. Apparently the red team had a bit of filming to do back at camp, so we went to a nice outdoor patio for drinks while we waited for the okay to return. When we got back to camp, we had some late night snacks, and learned that Heidi gets to go visit her homestead tomorrow! Me, Thomas, Brittany, Kelsey, and Lauren sat on the coastal cliffs and chatted for an hour plus about the experience thus far, the day and competition we just experienced, and what the future may hold for us. It was another huge, surreal day. We’re here camping on the coastal cliffs of Stavanger, Norway under a perfect night sky. It’s really tough to top this right now.